This month’s kit is all about aqua (watercolor) markers. The November subscription box is great for new and experienced crafters. Watercolor is so popular but not easy for everyone unless there are color coded numbers on the page telling you what color to use. For me, when I watercolor, I love experimenting with different backgrounds and techniques and this kit makes it very easy. Sara Davies, the owner of Crafter’s Companion, is so generous when she makes these monthly kits. The November box includes 3 aqua markers, 4 clear stamp sets (yes 4!!!! ), 18 card blanks with coordinating envelopes in 3 different sizes, 14 watercolor cardstock sheets (8×8), 18 colored cardstock sheets in complimentary colors, and a bunch of pre-cut statement sentiments. You’ll be able to make a minimum of 18 cards! This was delivered with auto-ship through HSN as always. You can check out Crafter’s Companion website for more information. This kit is truly a wonderful bargain. Each kit offers different items and will show you new techniques. There is a Facebook group that you can join once you subscribe which provides lots of community support and loads of examples; plus, Sara also has a monthly card kit site that you can refer to for demos/project pages. This month, there are so many different techniques in the video section because these markers are so versatile. In addition to this kit, I did use paper from past kits because there is always so much left over and I love the colors and patterns. I also used a few additional aqua markers that I previously owned from Crafter’s Companion. For the most part, the 3 markers that come with the kit can make a variety of colors and shades just by mixing them on a glass mat or on a craft mat. I LOVE my Crafter’s Companion glass mat. It is a true game changer. You can also buy an inexpensive craft mat to mix colors on that wipes off easily and is reusable. I used an inexpensive watercolor brush to paint the cards. It is easier to control the amount of color if you use a brush instead of bringing the marker to the cardstock directly. Lastly, I used a Spectrum Noir clear sparkle pen on some of the cards. I reach for this pen all the time!! For this first card, I only used the markers that came in the kit. As you can see, there are several colors on the card. The kit comes with pink, yellow and blue markers. The pink and blue make purple, and the blue and yellow make green (pink and yellow will also make a orange/coral shade). So in all, this card looks like I used 5 markers. I scribbled the pens on my glass mat and I used a watercolor brush to paint and blend the watercolor cardstock. These next two cards use similar techniques. Basically, I put color on the glass mat (I scribbled the markers) and brushed color onto the cardstock from darker to lighter for an ombre effect. Notice the butterfly on the right is lighter than the color around it? I used a faux bleaching technique to achieve this and then I added some shimmer with the sparkle pen. If you add water to a water-colored area and let it sit for a few seconds (I left it for about 20 seconds), and then place a paper towel over that area, it will “lift” the color off which gives it a bleached look. You decide how light or dark by adding more water or letting it sit longer. These were very fast cards to make and I really love how they turned out. For this next card, I used what I call a pouncing technique on the background. Again, I added color to my glass mat and used the brush to pounce color onto the cardstock. I added light colors first, and then I added darker shades. 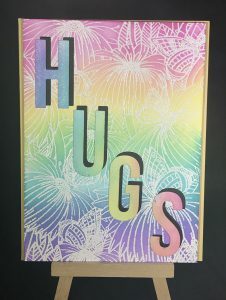 You can dry the card in between and add color on top of other colors to give it a more mottled look. This is such a fun technique. I then painted the flowers with a more solid color to add a little more dimension. I used vellum sentiments I had on hand from Crafter’s Companion. For this last card, I wanted to see if I could create a completely different look than the happier cards above. I was going for more of a distressed look and I think it worked. I used papers from older kits and I also used some brown and red markers in addition to the pink in this kit. I used a blending tool instead of the watercolor brush to tint the edges of the cardstock. It is really the same technique of scribbling on the mat and picking up the color with this blending tool instead. For the panels on the front flaps (left), I used the pouncing technique just as I did in the previous card. By changing up the colors, it really gives a different feel. For the inside (right), I added light pink to the butterfly and went over it with my sparkle pen. All of the layers and depth of color really transformed this card. So the bottom line is that there is no right or wrong way to use these markers. They can be used to blend, color, paint, pounce, scribble, tint…. really however you want to use them! As always, if you have questions feel free to reach out to me. I love to hear feedback and to see your works of art too so please do share! Until next time – happy crafting! Next Post Raffle Basket for Create Dance Center’s Annual Applebee’s Fundraiser 2018!